Kids There are 93 products. LBF has selected for you unusual kids accessories. Original creations signed Cocoeko, Mellipou et Mauricette, which favor color and design, all of which made in fabrics certified Oeko-tex, namely all eco friendly and without the use of chemical products. Environmentally and quality conscious of our products, LBF offers a selection of toys and games all made or built in an eco friendly responsible way in France. By means of our toys which always favor imagination, your children will be able to learn whilst having fun. Do you feel like personalizing your child’s bedroom? LBF offers original items and design all built in France. 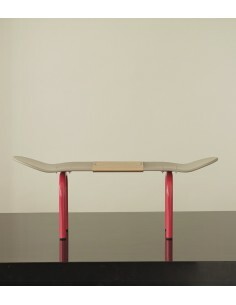 From the skateboard bench by Leçons de choses to the Reine mère blackboard, to coat pegs and FAB design sheepskin jackets. Let yourself be charmed by a fun and colorful universe. LBF offers children and baby care adapted to different ages with Enfance Paris. These soaps for daily use are specially elaborated for delicate and sensitive skins along the strictest quality and security requirements.